Getting Primitive: The Sound of a Balsa Raft Listener John Haslett recalls his time at sea on a primitive balsa raft off the coast of South America. The Los Angeles resident submits this SoundClip. From antique engines to defective ceiling fans, we are interested in hearing what you are hearing. 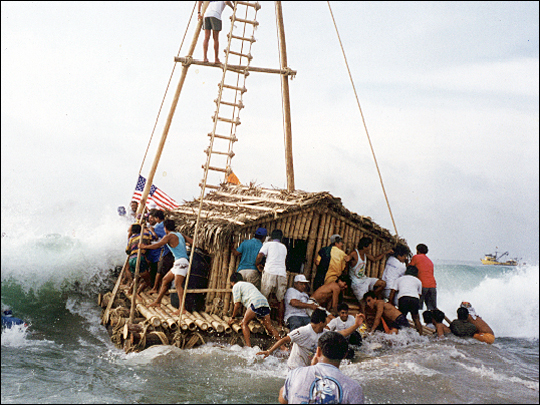 John Haslett and others launch a balsa raft in Salango, Ecuador, in March 1995. Listener John Haslett recalls his time at sea on a primitive balsa raft off the coast of South America. 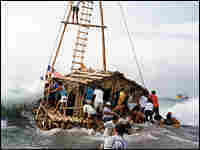 The Los Angeles resident and his friends built the balsa raft — a massive type of craft made famous by Norwegian explorer Thor Heyerdahl and his Kon-Tiki expedition — according to ancient techniques and sailed it on the ocean.